Police in Sri Lanka say that they have sent 24 bags full of ashes for testing from a suspected mass grave of government troops in the north-east. Jailed Tamil Tiger rebels have told the authorities the grave contained the remains of 26 troops they captured and shot dead, officials said. They said that eight soldiers and 18 navy personnel were tortured and killed there in January 2009. Police say that a small amount of human bones had been found at the site. Police spokesman Prishantha Jayakody told the BBC that in addition a "powdery substance" was suspected to be human ashes. He said that whatever was found had been sent for forensic testing. A team of legal and medical officers and a government analyst has been sent to the site, bordering Kilinochchi and Mullaitivu districts. Sri Lanka's long civil war ended in May 2009 with the defeat of Tamil Tiger rebels. Both sides frequently accused each other of war crimes in the run-up to the end of the conflict. Human rights groups have also accused the two sides of violating human rights, especially in the final months of the war. 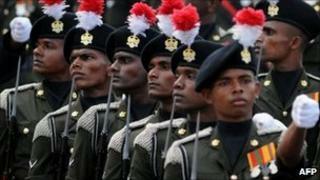 The Tamil Tigers fought for 25 years for an independent state for Sri Lanka's ethnic Tamil minority.